What tow car ability can a hybrid have? Practical Caravan's Tow Car Editor David Motton reviews the Mitsubishi Outlander PHEV GX4hs to find out if this is a suitable tug for your caravan holidays. It may look like a regular 4x4, but there’s nothing conventional about this Mitsubishi Outlander under the skin. As a plug-in hybrid electric vehicle (or PHEV), it can run on electricity alone or use a combination of petrol and electric power. It promises fantastic economy, depending on how it’s used. Plug-in hybrids typically cost much more than the conventionally powered cars on which they’re based, but not the Mitsubishi. It’s a close match on price for the diesel equivalent. We want to see whether the Outlander PHEV can live up to the hype. What’s the economy really like? What tow car potential does it have? Is this the future of towing, or are we better served by diesel? The Mitsubishi Outlander PHEV has a 1500kg towing limit. There are two ways of looking at that figure. The glass-half-full perspective is that it’s enough to make it a suitable match for a wide range of caravans. The glass-half-empty view is that the tow limit is well below 85% of the kerbweight – so the Mitsubishi cannot legally pull a tourer that's more than an 80% match – and some 500kg less than the Outlander diesel’s maximum. The towball limit also drops, from 100kg to 75kg. The task of pulling one SUV and up to 1500kg of caravan falls to three power sources. There’s a 2.0-litre petrol engine with 119bhp and 140lb ft of torque, and the PHEV has two electric motors, one for each axle. Both have 80bhp, while the front one produces 101lb ft of torque and the rear 144lb ft. Even when the hybrid powertrain holds the petrol engine in reserve, the car has similar pulling power to a modern 2.0-litre diesel. When the battery has plenty of charge, the PHEV is more than capable of towing on electricity alone. During our review, we hitched the Outlander to a Swift Challenger 530, with a mass in running order (MiRO) of 1345kg. The Mitsubishi accelerated from 30-60mph, as when joining the motorway, in 11.2 seconds. As the battery’s charge runs down, the car relies more on the petrol engine as a generator to keep the charge from becoming too low (series hybrid mode) or sending power directly to the front wheels (parallel hybrid mode). Even with no pure-electric range remaining (which doesn’t mean the battery is entirely flat, but that it is too low for the car to run without the petrol engine), the PHEV could still tow the Swift up steep A-road gradients at 50mph. However, in testing for the Tow Car Awards 2014, the Mitsubishi Outlander PHEV showed itself to be unhappy when stopping and starting while towing on a steep slope. It barely crept forwards when starting on a 1-in-6 hill. The PHEV was more enthusiastic in our emergency lane-change test. There’s some lean from the car when really pushed hard, but we found no shortage of grip and the Outlander was unperturbed by the tourer’s movements. At motorway speeds the Outlander also gives a reasonable account of itself. It lacks the rock-solid stability of the very best tow cars, but it holds a straight enough course without demanding frequent steering inputs. If you need to slow in a hurry, the brakes work well, stopping car and caravan from 30mph in 11.1 metres. In normal driving, the brakes help recapture energy that would otherwise be lost when stopping. The extent to which this happens can be adjusted using paddles on either side of the steering wheel. Judged purely on towing ability, the Outlander PHEV does a decent job, with the poor hill start the biggest concern for the test team. For that reason – and its higher towing and towball limits – we rate the diesel Outlander as a better tow car than the PHEV. It’s easier to make a case for the hybrid Mitsubishi over the diesel as an everyday car. First, there’s the eerie quiet in the cabin. As long as the car is running on electric power alone, there’s very little to disturb the peace, although road noise is noticeable over coarse surfaces. The performance is also surprising. You can shift along at quite a rate relying solely on electricity, with the potential to reach the wrong side of 70mph without waking the petrol engine. Even if the petrol engine is running, it stays quiet unless you accelerate hard. Whether the petrol engine is used largely depends on how often you charge the car. Mitsubishi claims a range of 32.5 miles as a pure electric vehicle, although the terrain, traffic conditions and temperature all affect that figure; around 25 miles is more realistic. Plugging the car into a 13A power source, such as a regular domestic socket, gives a charge time of five hours. That drops to 3.5 hours from a 16A supply. If you can find one of the growing number of public ‘rapid charge’ points, an 80% charge should take 30 minutes. There’s another option for replenishing the battery: press the ‘charge’ button behind the gearlever and the engine runs as a generator. This can be done while on the move or when stationary. There’s a ‘save’ button next to it; it’s not to top up the battery but to run the engine just enough to preserve the existing charge. All clever stuff, but what kind of economy do you get in the real world? If your commute is short enough, you can go days or weeks without relying on petrol at all. On journeys starting on electricity alone but increasingly relying on the petrol engine, our team routinely saw mpg figures in the mid-60s. Trying to get the best out of the hybrid is satisfying, but it is very ordinary in other respects. The ride can be lumpy and the steering is light and lifeless. So while it may not appeal as a driver’s car in the usual sense, the Mitsubishi Outlander PHEV’s technology makes it an addictive and intriguing car to drive. The space needed for all those batteries and motors often makes a hybrid model less practical than the car on which it is based, which is not good when you're packing for your caravan holidays. That’s the case here, but to a much lesser extent. There’s 463 litres of luggage space with the seats upright. That’s less than you get in the diesel version, but still quite a useful volume and much bigger than the capacity of a Volvo V60 Plug-in Hybrid, for example. If you need more space, then the rear seats fold flat, but the seat bases must be tipped forwards first. While the diesel Outlander is available with seven seats, the PHEV only has room for five, but that’s the single compromise hybrid owners make in terms of passenger space. There’s lots of legroom front and rear and, although the sunroof eats into headroom, there’s still enough for tall drivers and passengers to be comfortable without brushing their heads on the ceiling. We’d still like air vents between the front seats or in the door pillars, to blow chilled air at rear-seat passengers. Despite not being as practical as the diesel, the PHEV’s luggage and passenger space is less restricted than in most hybrids. Plug-in hybrids are usually rather expensive, but Mitsubishi has priced the PHEV competitively. Once the government’s £5000 plug-in car grant is subtracted from the price, the entry-level version costs the same as the diesel equivalent and higher-spec models are just £1000 more. That’s good news if you are thinking of shelling out your own money to buy a PHEV, but the car makes most sense if your employer offers one as a company car. With carbon dioxide emissions of just 44g/km, the PHEV sits in the 5% bracket for benefit-in-kind taxation, whereas the diesel automatic is in the 26% band. That difference will save a higher rate taxpayer more than £200 per month. You’ll save more money on fuel if the car is used mostly for short journeys and so can be run on electricity alone. On long hauls, the diesel will be cheaper to fuel (Mitsubishi says once over 106 miles, the sums come out in the diesel’s favour). 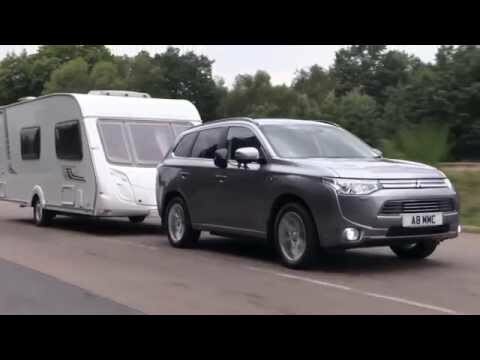 In Practical Caravan's own economy testing with What Car?’s True MPG team, the Outlander returned 40.6mpg when towing a 1500kg caravan with a fully charged battery. Repeating the same 26-mile route with the pure-electric range reduced to zero gave a figure of 24.7mpg. So, if you mostly drive short distances – especially if you drive company cars – the PHEV makes a lot of financial sense. It’s not going to suit everyone, but for the right kind of driver the Mitsubishi Outlander PHEV makes a lot of sense in different ways. If you rarely travel more than 25 miles a day, especially if you drive a company car, it is cheap to run and tax-efficient. The PHEV is also very enjoyable to drive, albeit in an unusual way. Forget about steering feel, nimble cornering and the things most car enthusiasts care about. The fun of driving the PHEV comes from its near-silent running on electric power and from making each gallon of petrol stretch as far as possible. The dashboard displays can be configured to show exactly what the drivetrain is doing, which turns every drive into a kind of school science project for grown-ups. It’s a fascinating and addictive car with which to spend time. What’s more, the PHEV succeeds in areas where other plug-in hybrids fail. For one, it can be bought at a sensible price. For another, it still makes sense as a practical family car. The 463-litre boot is a good size, albeit smaller than the diesel version’s, and there’s more than enough room for five to travel in comfort. Nevertheless, we prefer Mitsubishi's diesel Outlander over the hybrid as a tow car. Not only does it have healthier towing and towball limits, its fuel economy doesn’t drop off on longer journeys and it copes more easily with hill starts. Even so, the PHEV is a very impressive achievement.